BRAG - Better than RAG indicators? But what about adding Blue also for something that's taken care of but, say, is in an 'Outbox' waiting to be reported? This is an extra status that quickly shows the user that they've mostly done the work, but no one else is aware of it yet because they've not completed the report-back phase of work. #Privacy implications of #Android and #Glass microphones? Thanks, Graham Coppard, for drawing my attention to this fab video showing the potential for Google Glass to assist workers on a shop floor with all sorts of added-value information while keeping their hands free for tasks. However, what are the privacy implications of having Google's microphone permanently on, transmitting everything it hears for processing in the cloud? That's what we've got with the latest version of Android devices. Google Glass adds video to the sound. I can't imagine it's a great idea in a sensitive manufacturing environment, for example. #LinkedIn Intro "a spectacularly bad idea"
I like LinkedIn. I use it most days and find it very valuable. But I only use it through a browser, and with care. This week's launch of their Intro product is really, really clever. And extremely dangerous for the corporate customers they're targeting. And most won't know about the difficulties until it's too late when there is a spectacular PR disaster for LinkedIn. As TechCrunch has helpfully explained, for Intro to work the user has to trust LinkedIn with the username and password for their email account; and allow a copy of all incoming and outgoing email to go via LinkedIn's servers. Frankly, anything could happen to it there. Trouble is, most users won't know about the security and privacy implications of this, until it's too late. And with the trend towards BYOD (Bring Your Own Device) it's entirely possible that many, many corporate workers will download and install the Intro software blissfully unaware that they could be inadvertently sharing privileged emails and attachments like spreadsheets with LinkedIn, or a malicious server that pretends to be LinkedIn. Scary stuff and a great plot for a corporate espionage spy movie. It's not unreasonable or paranoid to be wary of this: in the last eighteen months LinkedIn has lost 6.5m usernames and passwords and it has been shown to transmit data from its iPad app over the Internet in plain text. I stopped using and deleted the iPad app immediately. For the last year or two I've been using RunKeeper to keep track of my runs. I've got a couple of years' use True Weight celebrating my healthy BMI because it's easier than graphing weight loss manually. And I've recently started to use Fitbit which records - in near real time - the number of steps I take, and when, with a pedometer. If I choose, I can record what I eat and drink. And it's oh-so-tempting to add a WiFi-connected scale (like the Aria from Fitbit or Withings) so that my weight is logged in the app with no effort. If I had an appropriate health issue I could add a blood pressure, heart rate or glucose monitor, etc. But I know that the Terms and Conditions I have to sign up to use most of these services allows the provider of the app to sell and share my data with advertisers and insurers. Is that OK? And what happens to my data in future if one of the companies I'm using gets bought by another? At the moment it doesn't affect me: I've not noticed any changes in the advertising I receive; and there are no changes to my insurance premiums. But will I regret the loss of control that I'm giving up in return for cool features and convenience? One never expects (or hopes) to use insurance. But it's vital that it's there, in case it's needed. A month ago, on 8 June, my great friend and colleague Barry Brown died unexpectedly at age 42 while playing basketball. Read more. Barry had been responsible for much of the technical design and production (writing software) of several of our company's products and his loss is a huge blow professionally, as well as indescribably personally. So, we're currently testing our Business Continuity Planning in practice. We're too small to have had a fully-worked staff team and cyclical planning process! But we're so grateful that we're not just thinking about these issues for the first time and with hindsight. And we hadn't stopped there: we had determined the importance of having regular backups and documentation and access to business-critical information like passwords, software license keys, recovery keys, and more. We were able to gain access to everything not in Barry's head within a very short time; and have continued to tighten procedures in the light of our experience. For example, we've now established another internal shared documentation space that everyone can contribute to and access easily if the need arises. But our realisation is that recovery still takes time. One month on, we're still in business when others would have been derailed by something this severe. We're acquiring new customers. We've got new staff resources in place. We're almost back to production, albeit at slower pace for now. And we're wiser and still more prepared. That's probably the best we can hope for right now. One of the nicest people I know is having a 50th birthday party. He is refusing gifts, but is holding a charity auction and wants some things to sell. So, how does this seem? Please give me some feedback, here or by contacting me directly. Thank you so much! 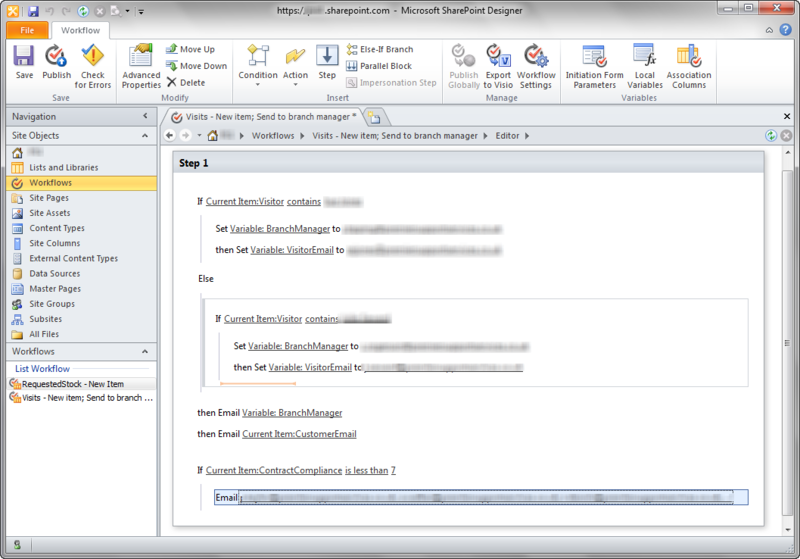 We are experimenting today with adding RAG (Red / Amber / Green) indicators in SharePoint Lists. It's a pretty clear way to draw someone's attention to the most important items. And the nice thing about this implementation is that the data is being submitted automatically from a form drawn in the Starfish CI app on an iPad. Here's a snapshot of that iPad form, drawn with the ease of drag and drop - no programming required! If only the SharePoint configuration was so simple! Firstly, Italian Daniele Mauri sent me a message via LinkedIn with some tips on how to improve the search engine ranking of our videos at www.YouTube.com/StarfishCI - His not didn't cost him much more than time, but it certainly impressed me with its usefulness. It makes it likely that I'll recommend him to others; maybe use his services for our own company activities; and I was able to repay the compliment by providing him with a LinkedIn Recommendation. I work for Centigon Solutions, and our team is socializing our mobile location intelligence platform called GMaps Mobile (http://gmapsmobile.com/media.html). I very much enjoyed your list as I have been researching experts who cover top lists of apps for business and enterprise. I wanted to suggest our location intelligence App called GMaps Mobile for consideration as you round up your apps list. We are a leading producer of location based visualization for SAP BusinessObjects and have found a way to increase productivity for mobile workers who on on the ground selling, delivering, repairing, and performing other tasks as front-line employees with actionable, location intelligence. I wanted to invite you to check out GMaps Mobile (http://gmapsmobile.com/media.html ) and I would certainly be interested to get you on a conference call with our CEO, Ryan Goodman who has a wealth of knowledge and experience in business intelligence, analytics, location intelligence, and enterprise mobility. I hope that you will consider us if in the future for any quotes or references you are still covering this storyline. Over the past weekend we released Version 1.1 of Starfish CI to the App Store. Within hours we'd discovered that a bug had crept in between v1.0 and v1.1 - the app continues to work, but the screen resolution on Retina iPads is screwy and it doesn't look as good and professional as it did and as we want it to. We're embarrassed that this slipped through our testing. Now, with so few users of such a new app it was really tempting to stay quiet about this and work hard on the fix before too many people noticed. After all, what we'd lose in short-term disillusion we'd gain in that there'd be no Internet history of the blunder for people to find through Google in future. But we think that's entirely the wrong approach. It doesn't sit well with our ethics; and it doesn't make sense in the Internet era - If we don't blog and Tweet and acknowledge our problems (as well as shout about our good points) then others will. And we'd look worse. The post admits we got it wrong; says 'sorry' and asks for patience while we fix it - and gives, we hope, sufficient info about what went wrong and what we're doing to remedy. Each update to the blog is highlighted on our Twitter account. We've learned (the hard way) not to have just one communications channel (because that might be the thing that goes down!). We've tried to learn from experience: while we are having our, relatively minor, hiccup Google Drive is apparently 'down' (we saw this from other Twitter users): even the biggest companies have difficulties from time to time with software. And there are plenty of stories of major brands suffering as a result of their silence. Further, years ago in another company, one of our suppliers went out of business in the early hours of the morning, affecting us and each of our customers. While colleagues worked on a a solution, I made contact with our customers a top priority. Within hours we'd restored service and re-located the business operations to an emergency location where we stayed for a few weeks before we could make a planned, controlled, move back to new facilities. We kept everyone informed throughout. In that last case what could have been disaster turned into a positive illustration of the lengths we'd go to for our customers. In this present difficulty we're too busy resolving the problem to be playing it for positive spin for the future. But still we hope that customers will appreciate that in the UK we worked on this until 03:30 this morning; and there's not been much sleep in America, either! On balance, I'd rather be transparent, for better and for worse, than try to pull the wool over others' eyes. Some of us in the iPad for Business forum on LinkedIn have been observing the disruptive nature of mobile technology. By taking an iPad or two to replace paper forms on a clipboard, businesses can make their field staff so much more productive. But it doesn't stop there. As this video shows, incoming data can transform the business processes back at head office to cut cost, improve speed, reduce errors and gain competitive advantage. Here's a 7-min video that acts as a memory-jogger for a customer with whom we were setting up a little workflow operation to send an email summary to the Branch Manager whenever an Inspector saves a new report item to the Inspections List on their SharePoint site. The client has begun to replace paper on clipboards with electronic forms on iPads: already, the data gets captured straight from the iPad and stored safely and securely in the central database, run by Microsoft SharePoint, and with no costs of keying the data in, or correcting errors! Reported to the Branch Manager and the Inspector, in summary form. Acknowledged back to the end-user customer: no longer does the Inspector have to leave behind a carbonless copy, the customer will get a courtesy email. There's no admin time in making this happen, because SharePoint takes care of it; and reflecting the 'contract compliance' score back to the customer acts as an audit trail to keep the Inspector honest! If 'Contract Compliance' falls below an agreed level then SharePoint will automatically generate an alert email to go to the appropriate individuals in the management chain: they can get all of the information they need, right there in an email to their mobile device, and they can take action at once, without waiting for a paper form to find its way back to the office and through the system before they become aware of a problem. Similarly, whenever a field worker fills out a request for new stock items on their iPad form, the resulting order is picked up by SharePoint and can be automatically routed to the right person. And that's just the start! Find out how to do this in your business. The technology is simply great at letting ordinary mortals do things that just a little while ago would have taken a whole army of specialists. Take a look at this 1-min video showing off the GPS Locator tool from the StarfishCI app. Previously we'd have needed to bring in a specialist company; but now with a bit of software and a good video camera, tripod and some other bits, we can produce the whole thing in-house. That saves us heaps of time; and quite a lot of cash; and gives us the flexibility to experiment with content and get things just as we want them, without running up a bill with a team that's on the meter. And the results? Good enough - Absolutely not as good as the professionals would do; but good enough for this stage of things. However, the down-side to all this astonishing productivity is the sheer range of skills that one has to pick up, fast: It's amazing to me how much there is to get right: lighting, sound levels, camera angles, script, content, file format conversion from Sony camera ultimately to mp4, editing, mixing the audio backing track, getting sound levels for that right, adding captions, titles, closed captioning, uploading to YouTube, keywords ... on and on!! Not many people can work effectively across each of these disciplines; and there's a huge amount of trial and error involved in the learning process. So the trade-off is time and there is a huge, hidden, cost associated with these productivity tools; fortunately masked by the fact that, mostly, this is fun - when I'm working to my schedules and not someone else's! This is the first in our mini-series looking briefly at the StarfishCI Toolbox controls. This video features the last control on the right hand side, the Button, which is used to allow the user to save data in the form, firstly to the iPad and then to Microsoft SharePoint. Other brief videos will follow in the next few days; each looking at other controls. With HMRC announcing its purchase of up to 7,000 iPads it’s clear that Apple’s device is meeting the needs of business, not just web-surfing domestic users. More proof comes with the announcement that Barclays Bank is buying 8,500 iPads and Coca Cola some 120k: Apple claims the whole Fortune 500 has some iPad use! Yet a door-to-door survey of Cheltenham estate agents is typical. It shows that a third of them haven’t even given tablets a thought; another third are thinking they’ll do something, one day; and the remainder are already ahead of the game, actively trialling use. This last group is pretty much just using it for mobile access to property details on their web site, with a bit of email, calendars and maybe Apple’s excellent software Pages (word processing), Numbers (spreadsheet) or Keynote (presentations). Personally, I love to use a drawing app like SketchBookX instead of pen and paper: great for a ‘pencil sell’ and, with the iPad projected on to a screen, it’s better than flip chart or whiteboard! Better still, with a bit of preparation, I can have all my documents as PDFs on the iPad, reducing the clutter I carry around to meetings. Without doubt, those are the basic workhorse apps. But savvy users can do more. The key to outwitting competitors comes from finding niche use specific to your business. Something that will cut costs, increase revenue or raise competitive edge. Start by searching the App Store with keywords for your industry; or your business need. Ask questions in the iPad for Business group on LinkedIn. Then, there’s the option to roll-your-own, and link in with your existing business systems. For example, @StarfishCI allows any one to create an iPad replacement for a paper-based form with the ease of drag and drop. You can replace paper on a clipboard in minutes, and have your data link straight to the commonly-used Microsoft SharePoint database, for example. Something like this can save you significant time, while reducing the costs of entering data and improving your speed and accuracy. All this helps you do more with less; and with the iPad Mini starting at just £269 inc. VAT, these projects can be really easy to cost-justify, with a measurable positive return within months. One company claims savings of a half an hour per person per week now they've moved from clipboards to tablets: with 16 workers, that translates to a full day's time saving each week, or approximately £20k saving per year. In addition, the've got better / faster / cheaper / more accurate data entry, and increased competitive edge. Amazing what engineers spot: today I was told I was 'brave' to use the candles in the video we produced the other week. I was talking with an engineer and he explained that he'd wondered how I'd replaced the candles in the video to make it look like a consistent burn with no time gaps. Extraordinary! The answer is that it was done in one 'take' - no gaps or pauses in the shooting of the video so the candles were genuinely burning all in one consistent period. I guess this is the sort of forensic evaluation that I should be used to after a TV diet of CSI and similar! OK, I'm 'old' - old enough to have been in the IT industry since before my employer IBM launched the PC. But that gives me a useful perspective on what's going on. There's this principle known as Moore's Law which, simply put, means that each year we get more for less, in computing terms. Power and capacity grow consistently; while the costs of achieving it fall. The only way publicly-listed IT companies can maintain their share price and stock exchange expectations in the face of falling revenues for selling the same goods is to cause consumers to want ('need') to buy new goods that can be sold at a premium margin. Each of these has been some sort of step forward; but each transition has been marked by a bad-mouthing, pushing into obsolescence the technology that went before. The driver is not so much technology as economics and the need to fulfil the expectations of stock analysts for ever-growing revenues. Expect cloud computing to remain as the hot topic for a while longer; but know it's not 'the end' and something else will be sold soon. We took the opportunity to buy a new domain name, Starfish.CI, mostly because we could, and because we want to be able to protect the brand. At the moment, Starfish.CI simply points to our existing StarfishCI.com site. When it rises to the top of the to-do list, we know we need to do a major overhaul of the site; at present we're mostly re-directing to the sub-domain blog.StarfishCI.com with some moderately ugly content - our budget is targeted elsewhere right now! But, we're wondering whether we can and should do something more creative with Starfish.CI - What? As Dave Boon said on LinkedIn, the .com is well-recognised internationally and establishes our presence in each market. The .ci (Ivory Coast) is expensive as a top-level country name, but it is rather cool to have to re-inforce our company name and brand. My question is whether it can be more than this? This brief video shows how easy and fast it is to create an iPad replacement for a paper form, just by dragging and dropping fields off a Toolbox and on to the iPad 'page'. The data goes straight from there to a Microsoft SharePoint or similar database and we never see your data. More than this, the iPad form can combine GPS location information with the date and time, even a signature or a photograph with hand-drawn annotations on it. All in all, it's a great way to save cost and time, improve speed and accuracy and reduce errors while gaining a competitive edge. I'm struck by the challenges we all face to finish what we started. My customers have started pilot projects, but then got distracted by crises elsewhere in their business and become paralysed in decision-making. The short-term consequence is that we can't begin to deliver the cost savings they're looking for. My computer / iPad / iPhone / All the above flash notification messages and beep sounds as new messages, tweets and other events rush in, clamouring for attention. We're living in a world that's rushing ever faster; and it's not acceptable to disengage: if I'm not running the social media treadmill along with anyone else then I simultaneously miss out on learning what I need to know and also lose the opportunity to get my voice heard. It takes practice and discipline and taking time out to understand goal and priorities then focus to maintain any kind of momentum. As I'm replying to one exciting email enquiry from a potential customer, it takes an effort of will not to stop and turn my attention to another enquiry from an even bigger prospect! Memo to self: I guess I fail more times than I succeed; hence me thinking about the need to focus in this post today. Here's a blog post unlike my others. If I remember in the midst of everything else I'm doing then I'll come back to this post and update it as I go along. It'll be useful to me as a memory-jogger of the steps I've taken, in no particular order, to market our new app; and it might prove useful to others who have a similar task to perform. I used a URL-shortener to grab http://tiny.cc/StarfishCI so that I have a chance to send people to our page on the App Store without having to use a complex URL, and I can track how many times the link gets followed, too. I wrote a blog post about the software launch. I mentioned the launch in a post on this site. I edited our company page on LinkedIn and created a LinkedIn Product profile about it. I began to use Twitter a bit more to talk about the product, including automatic tweets to the blog posts. I've just finished up a conference call from UK to USA, while replying to an incoming text message and a couple of emails that arrived on one of the four screens ranged in front of me. And who says men can't multi-task?! The trouble is, the faster the pace of communication and the more channels I have available to me, the more I feel like I'm missing out or not keeping on top of things. The technology is meant to be at my service, but it often feels like it's the other way round and I'm serving it. Nevertheless, the benefits are huge: we launched a new product over the weekend and, because it's in the App Store, we went global instantaneously. Without even trying, we'd got downloads in a dozen countries before Monday started in my part of the world. With benefits like that, I'm a tech fan not a luddite!